Cnaeus Lucretius Trio was one of the moneyers for the year 136 BC. He may be an ancestor of Lucius Lucretius Trio. Gens Lucretia was a prominent family of the Roman Republic. Originally patrician, the gens later included a number of plebeian families. The Lucretii were one of the most ancient gentes, and the wife of Numa Pompilius, the second King of Rome, was named Lucretia. The first of the Lucretii to obtain the consulship was Spurius Lucretius Tricipitinus in 509 BC, the first year of the Republic. The only patrician family of the Lucretii bore the cognomen Tricipitinus. The plebeian families are known by the surnames Gallus, Ofella, and Vespillo. Gallus was a common name referring either to a Gaul, or a cockerel. Vespillo, an occupational surname referring to one who removes corpses, was bestowed on one of this family who had thrown the body of Tiberius Gracchus into the river. 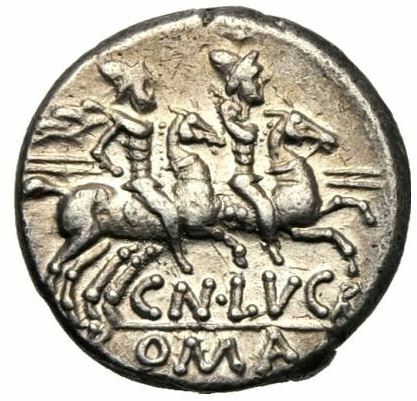 On coins, the cognomen Trio is found, but it is not mentioned in any ancient writer.